"Lady Aderishia is sealed. She is not dead, but that also means she is not alive." (Note: This review may contain potential spoilers for those who have not seen Legend Of Crystania: The Motion Picture. I would recommend not reading it unless you are already familiar with it. )The story of Redon, his friends, and all of the magical land of Crystania continues from the original movie in this three episode mini-series, entitled The Chaos Ring. Beginning not too long after the events of the film, we find Redon, Obier, Raifan, and the rest of his comrades trying to make a life for themselves in the world of Crystania, which has been turned upside-down by civil war. With the dark lord Barbas dead (as well the powerful priestess Aderishia), most of the people in Crystania want to live normal lives. Most of them abandon their ancient religions and gods and, as a result, lose much of their magical powers. Unfortunately, the conclusion of the war against Barbas has only made things more complex. While most people want to end all the old conflicts, the disruption in the realm has "unsealed" many magical creatures from the ancient past; things like dragons and deadly basilisks. Something very terrible is going on, and it seems to have something to do with the Chaos Realm, the ethereal plane where the souls of both Barbas and Lord Ashram now reside in torment.Those who followed Barbas still wish to revive their lord, so a familiar plan is put into action: they will attempt to use Chaos Rings and the powers of Lady Sheru (Pirotesse) to bring Barbas back. Knowing her life is in danger yet again, Sheru attempts to use the powers of the Butterfly People to enter the Chaos Realm (they are the only ones capable of such a feat) so she can awaken Lord Ashram, the "good" hero who can stop all this madness. In the meantime, Redon and Orbier, even though they're unaware of it, are both on the same quest; to find Lady Aderisha who, according to local mysticism, didn't actually die in the original battle, but magically sealed and able to be awakened. This is the setting of Chaos Ring and, unlike the rather straightforward simplicity of the original film, the plot is considerably more complicated. The series attempts to not only create more adventures for familiar heroes, but also delve deeper into the mysticism and lore of the Crystanian people.The storytelling is pretty solid and very entertaining. However, I'm not sure the series format works very well here. To put it simply, the overall length feels about an hour longer than it needs to be. The original film managed to pack an amazing amount of fantasy/adventure into only 80 minutes; here the pace slows down considerably. Now, given all the ground that author Ryo Mizuno wants to cover, I suppose this series is too short for his imagination, but it could still manage to accomplish good things while moving quicker. Too much time is spent on needless rehashing of plot elements, especially in the first episode. All that aside, though, the deep fantasy of the Crystanian world is brought out in a much more detailed way here. We get to see a little bit of the other cultures and places. The spirited adventure is kept up and we see lots of interesting creatures, supernatural happenings, and bold battles. 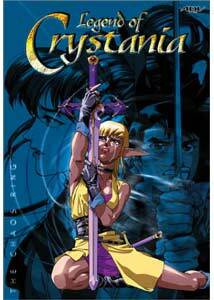 Crystania, in my opinion, is a world much more interesting than that of Mizuno's Lodoss War series, and provides more magic and wonder. Image Transfer Review: Although the source is a little grainy at times, the transfer manages to bring out all the color and inherent detail in the animation without any issues. Black level is slightly off and is more of a dark grey, but it really doesn't have any lasting effect over the program. There are no problems with over-sharpening or ringing. The artwork in this series is slightly different than in the original motion picture; it's not quite as "raw" or comic-styled. Basically, it's more detailed, but the character designs are still pretty much the same. Audio Transfer Review: The Dolby 2.0 audio is primarily stereo-based, with very little in the way of surround usage. Regardless, it's still a very functional track that's extremely clear and crisp. Some of the sound effects are a little dull and lack impact, but it obviously seems due to how they were originally recorded rather then problems with the disc. Dialogue is perfectly understandable, although viewers will notice some slight changes in voice actors in the Japanese cast from the original film. The English dub is acceptable, but not great, and again there seem to be differences between voice casts. Extras Review: The only real supplements are trailers. The original opening animation for the series is presented without text, but it is the same animation that's served as the series trailer on past ADV discs. There are additional trailers for other ADV releases plus the trailer for the original Crystania movie. More chapter stops would have helped given that each episode is about 45-minutes long. The intro/part A/part B/credits chapter scheme works fine for 20-30 minute series, but it isn't quite enough here. On a related note, I could not find English credits for either the Japanese voice cast or the English voices anywhere on the disc. The credits are entirely in Japanese and, unless I missed something, are not translated (the only subtitles are the lyrics for the ending theme). Regardless of those complaints, the disc is nicely designed with very stylish menus and presentation (although the cover artwork doesn't really reflect the artistic style of the show). Anyone who liked the original Crystania film should definitely check out this sequel, of sorts. It's great swords-and-sorcery material, with a bit more depth as it uses the mini-series format. It also provides the room in which more stories can develop and grow. I have a feeling we might see more of Crystania in the future.